I stepped outside one day a couple of weeks ago and all of a sudden Summer had jumped into Autumn. Not faded, mind you, as many poets have told us that it does, but jumped, leaped, maybe even threw itself into Fall. And yes, where I’m from it isn’t officially yet “Autumn”, which is scheduled to be with us in late September, but I don’t go by calendars when it comes to the changing seasons! You know how I could tell? The light and the smell. As the seasons shift across the globe and the tilt of the earth angles through its yearly course, there is a nearly, but not entirely imperceptible shift in the rays of the sun’s light as we migrate through the day. Rather than dead above us at noontime, they begin to slant as Autumn comes and are most slanted of all in the Winter. These slanted rays give us part of the feeling of “crispness” in the Fall air. As leaves turn and fall to the ground they seem to dazzle us in the spotlight rays of slanted sunfall. 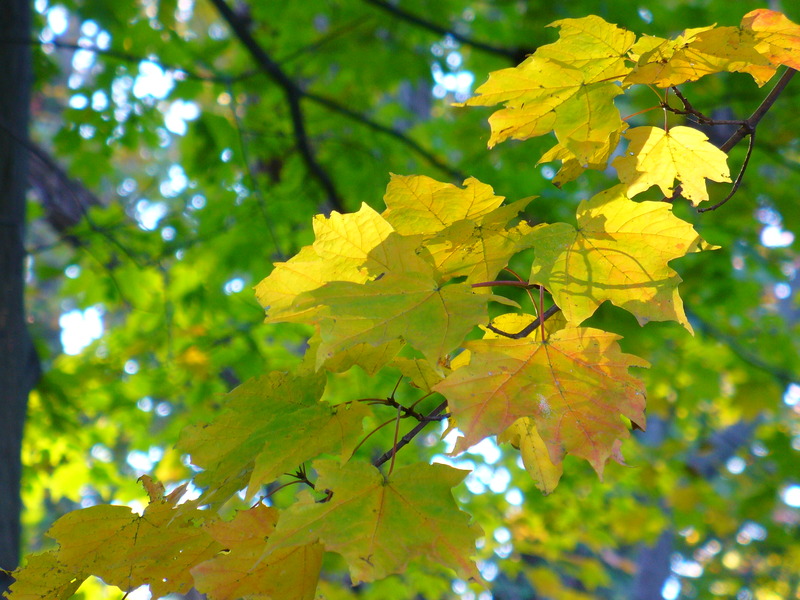 In addition, the tiny, first shift in color from deep green to lighter green of the maple trees began in early August. By late August, when the slanted rays of sunshine meet that delicate color change, the light takes on a pink glow. It really is tremendous to watch it happen, but you have to step away from the devices daily to see it. Don’t get stuck in a digital world, when the real one is so fully and fantastically before us. Lecture over. The other measure of the autumnal shift? Smells. I like smells…some of them. But I really like the smell of the grass, the plants, my garden, veggies, roses, myriad things. And I really, really like the smell of lavender. I like it so much that, wherever I move to a new place I plant it, a lot of it. Always. It is spicy, floral, slightly soapy, strongly herbal, but not perfumey. A good whiff of it will cause your central nervous system to take a short rest and step down from “high alert.” It is a powerful, soothing herb…and it repels many bugs (does it get better than that?). As I step outside my front door I am gladly assaulted by this wonderful fragrance. Most especially following a good heavy rain the moisture releases the oils in the leaves and carries it into the air. As Autumn rolls along, and the temperatures cool, the leaves begin to fade and the fragrance of the lavender shifts and takes on a stronger woodsy scent. That’s how I know my seasons are moving along. The plants also die, but that’s later. I love to measure these tiny markers of the seasons for many reasons, but especially because it reminds me to appreciate nuance. To collect those little details that are seemingly unrelated or irrelevant, but put together paint a larger, more complete, eventually overwhelming, and sometimes sinister portrait. And this is where history comes in. The sinister bit. History, when you measure it as it happens around us, something we call, “the news” or “current events,” you must be alert to these “tells” or tiny bits of nearly imperceptible change, shift, and nuance that added together, give us a sense of where things are going. Better times or worse. I don’t mean to be a rain cloud, but times are not getting better. That’s the sinister bit. The tells and details of the moment are plain if we watch for them. We are in for turmoil, the whole world. Instability, migration, and hostility among the great and small powers are cause for concern. But there is profit in chaos (and no, not what you are thinking). We, as individuals, who live through the crucible of chaos have the opportunity to develop our true selves (please don’t take that in an flaky, “new age” sort of way), our deepest character and conviction that is at the core of who we are. The honor code, the force of principle that we must have and must develop to enjoy any sense of a meaningful, fruitful life that will see us through tough times. I get my inspiration and that core conviction from the Bible. It is a personal journey, just like history, which is the measure of our experience in life, both personal as well as communal. Everybody has to face history. So learn to see the tiny details, watch for what is coming and tackle those core principles you need to soldier through the tough times. It’s all part of the historical experience. Just don’t be a footnote of history, really live it! The victory garden movement was meant to encourage civilians to develop their urban and rural spaces into large scale kitchen gardens. The kind that would keep an average family of four in potatoes, carrots, and turnips all winter long. The idea was to reduce the burden on the domestic vegetable and fruit producers so that their industrial sized haul of produce would be primarily shunted to foodstuffs for the U.S. troops. It was also meant to reduce the oil, coal and gas used to fuel transit of produce from one end of the country to the other. This effort was so successful that average Americans produced 1/3rd of the annual vegetable crop for consumption during the war years. More importantly, a whole generation of young people grew up knowing how to garden and how to eat locally, keeping their ear to the ground as it were. Knowing how to produce food is invaluable. Even if you only have a small garden, the simple experience of watching a plant grow to maturity and seeing the fruit form gives you insight into the quality of the vegetables and fruits you will be buying at the store or the roadside stand (I recommend the latter, these folks benefit from your business and the product is usually much tastier than the grocery-store variety). I haven’t had the means or space for a full scale garden in several years, but I still love to cast my mind back to the garden my grandparents grew. They were children of the Great Depression and their grandparents pioneers into the west before them, so “growing your own” wasn’t a leap of logic, but a standard operating procedure. My grandparents used half of their roughly one acre yard to create a substantial and highly productive victory garden. I spent many memorable moments helping dig up potatoes (they come from the ground, by the way, not trees, just thought I would clarify…you never know), picking raspberries, and other produce. I learned what good soil smelled like, that veggies were supposed to have dirt on them, and that with plants…you have to have patience. 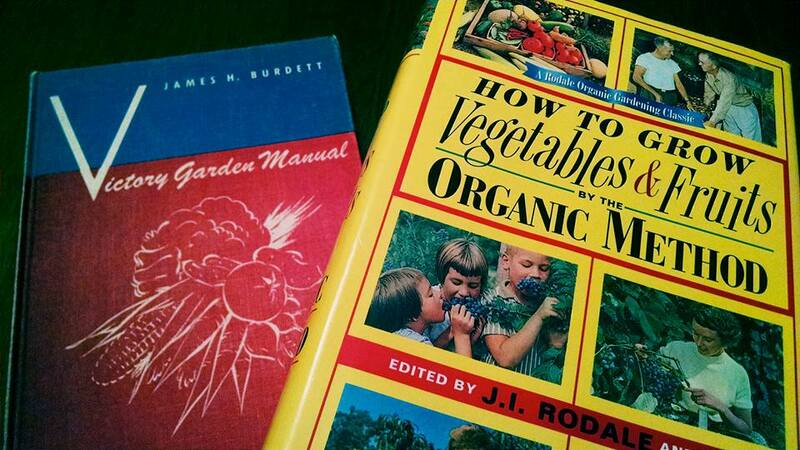 So, back to The Victory Garden Manual, this lovely little book is a project of it’s era, a red-white-and-blue cover with a big “V” for victory. It has just a few color photographs that look like they might be lithographed, but they are beautifully composed and show off the abundant produce of the test garden. Truly inspiring. 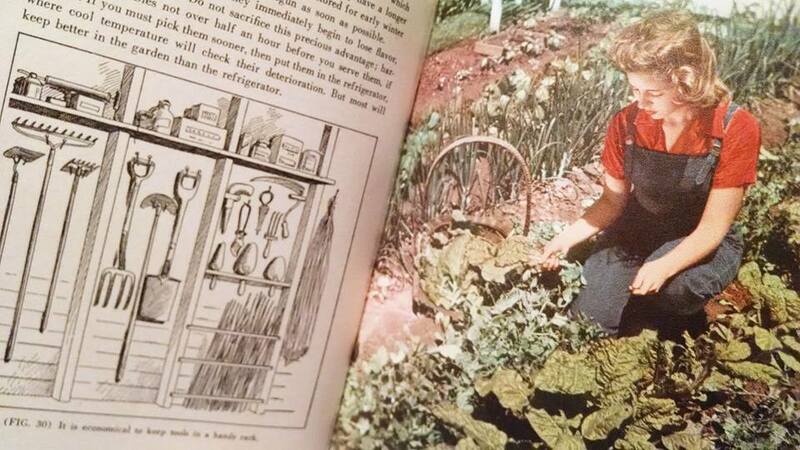 However, I have another favorite gardening book, this one, a reproduction titled, How to Grow Vegetables & Fruits by the Organic Method that was first printed by Rodale Books in 1961. The reproduction print run from 1999 is still widely available and they sport a bright yellow jacket with vintage 1960’s photos of various gardeners and their surplus. What makes this such a great book is the comprehensive nature of the material. 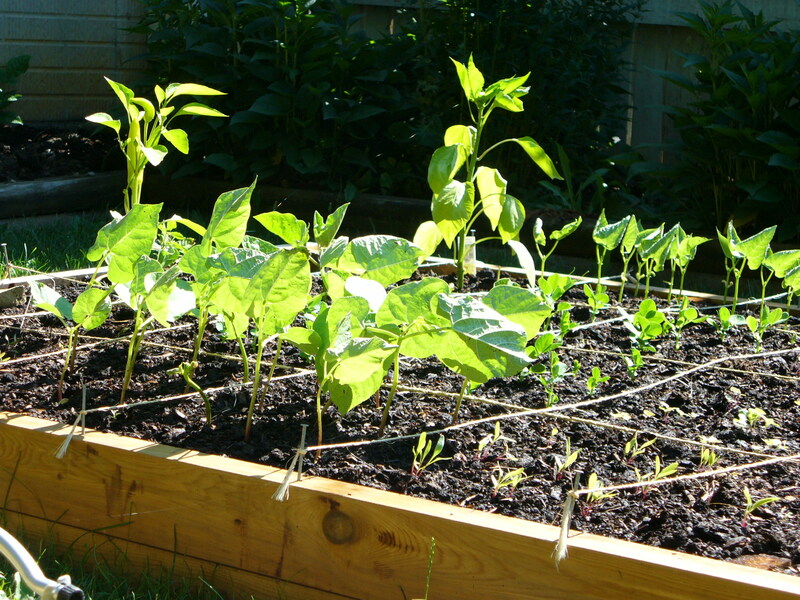 It covers everything from planting to harvest to saving seed and, of course, how to grow a garden with basic knowledge of soil health and structure and without toxic chemicals and pesticides. Great stuff. I hope this post will be an insightful little nudge to go out and grow something. Anything, from a giant backyard kitchen garden to as small as a few pots here and there (my garden this year). There is an education in growing things. I think we find ourselves more balanced after time in the natural world as we seek to understand the creation and the Creator than we do in the digital creations that seek to obscure reality. Gardening demands patience, curiosity, and the capacity to deal with loss. These are all vital qualities that help us, when translated into human interaction, to relate to others and to seek to understand them. So dig in, don’t be afraid to grow! Because you will when you tackle vegetable gardening! Having recently spent time getting my own small vegetable garden prepared for planting I was reminded of the work that went on across the nation as Americans got back to the land and grew Victory Gardens during World War II. Victory Gardens were a pivotal way to make a personal sacrifice of time and effort on the WWII home front. Not that growing your own food was much of a novelty at that time. Many people still filled their produce needs by growing their own as agrarian America had done for centuries. According to the Victory Garden Manual published in 1943 and written by James H. Burdett, “War, food rationing, and the Victory Garden campaign have given millions of Americans a new appreciation of vegetables. About 20 million Victory Gardens were planted in the United States during the war. Folks in the country and those in the city turned their yards into large vegetable patches capable of feeding a whole family for most of the year if stored properly. Victory Gardeners effectively produced 9 million tons of vegetables. For many young adults during the war the habit of growing a large, “Victory-style” garden never left them. My grandparents, for the rest of their lives, continued to grow a massive vegetable and berry garden that took up nearly half of their large yard. I have great memories of visiting the red raspberry vines and eating my fill. My first experience of harvesting potatoes was with my grandma in the garden as I helped her fish them up from the depths of the soil, like buried treasure. Historical trends swirl around and pop up in the present every now and then and growing one’s own produce is about as good a trend as I’ve seen in a long time. Many people are growing their own because it cuts down costs and enables a more bountiful table during a crummy economy, others are influenced by the philosophies of environmental causes, and some believe that homegrown is healthier because it is generally treated with fewer chemicals. Me, I just like reliving history and knowing that if I had to grow my own produce, I could. That said; I still have a long way to go to achieve a true Victory Garden!